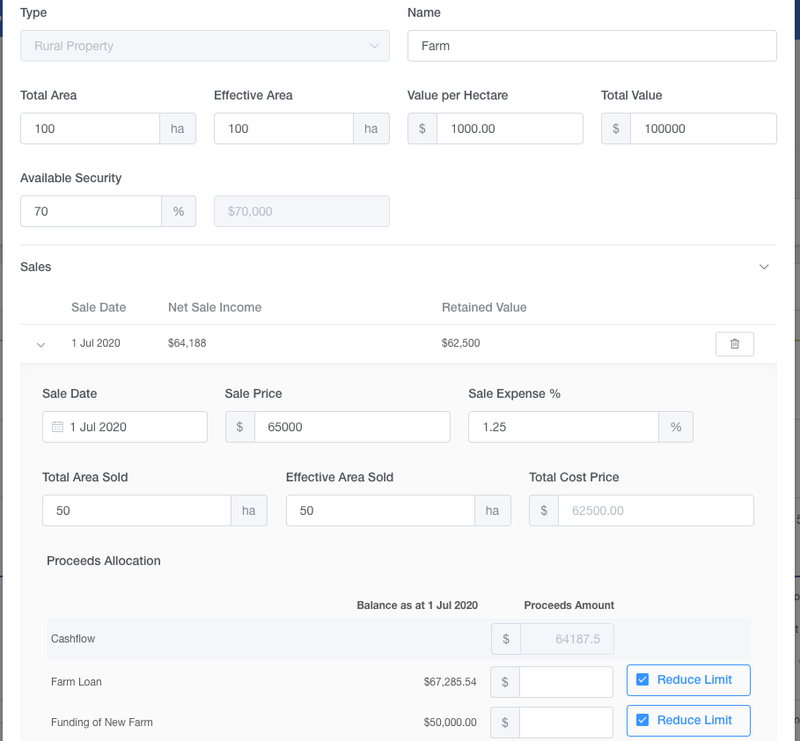 Once your opening position has been set, you can continue on to build out the remainder of your scenario - including adding in new assets, liabilities, and entering your income & expenses. You can also adjust interest rates and drawdown on existing loans. New assets can be added into the proposition by selecting + Add Proposition, and entering in an asset type and any required information. 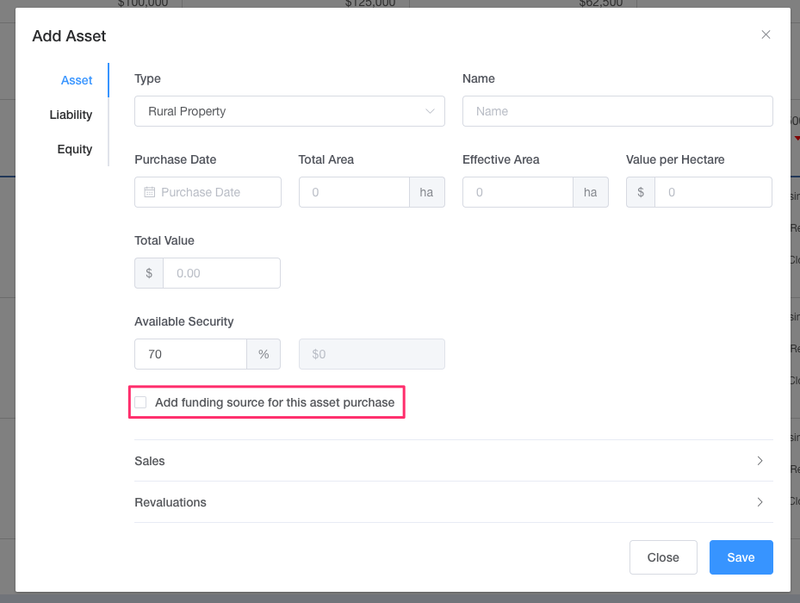 If required, you can choose to fund the asset purchase with a liability using the checkbox above. 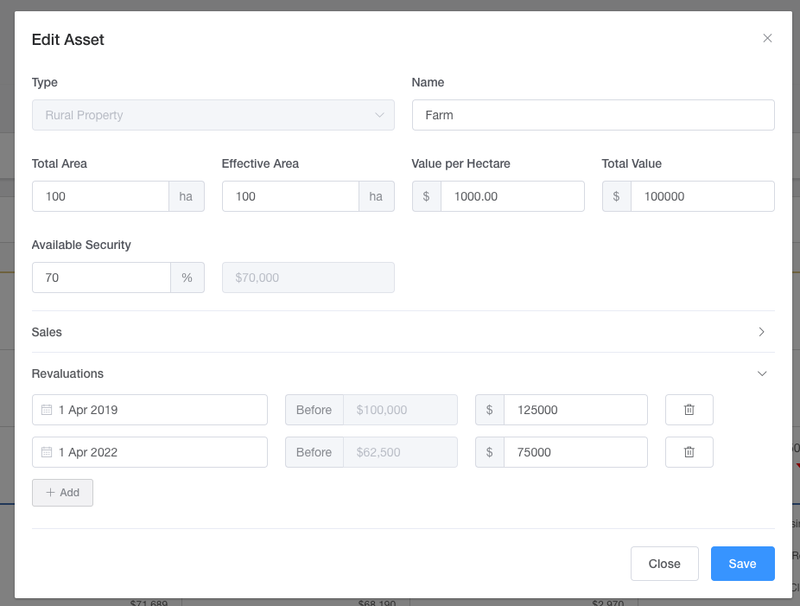 Once you've filled in and saved your asset, it'll then create a liability for you with some information (like date and value) already filled in. NOTE: Total area is the total area of your property, whereas effective area is the area of your property that is usable. For example your farm is 150 ha, but you have 30 ha which has bush on it and thus is not used. Your effective area is then 120 ha. Revaluing an asset can be done in the proposition by clicking into the asset, from there you'll see an option to revalue the asset which will update your balance sheet. If you're wanting to sell an asset, you can do this in the same place as revaluing - click into an asset under the proposition. For rural property and shares, you can choose to partially sell these. You can also choose to allocate part or all of the asset sale directly to an existing liability, this will lower the loan balance (and limit, if ticket). If no proceeds are allocated, it'll go to your cashflow instead. Here you can enter any new funding your scenario may need - like a bank loan to purchase a new property, or a hire purchase on a tractor. 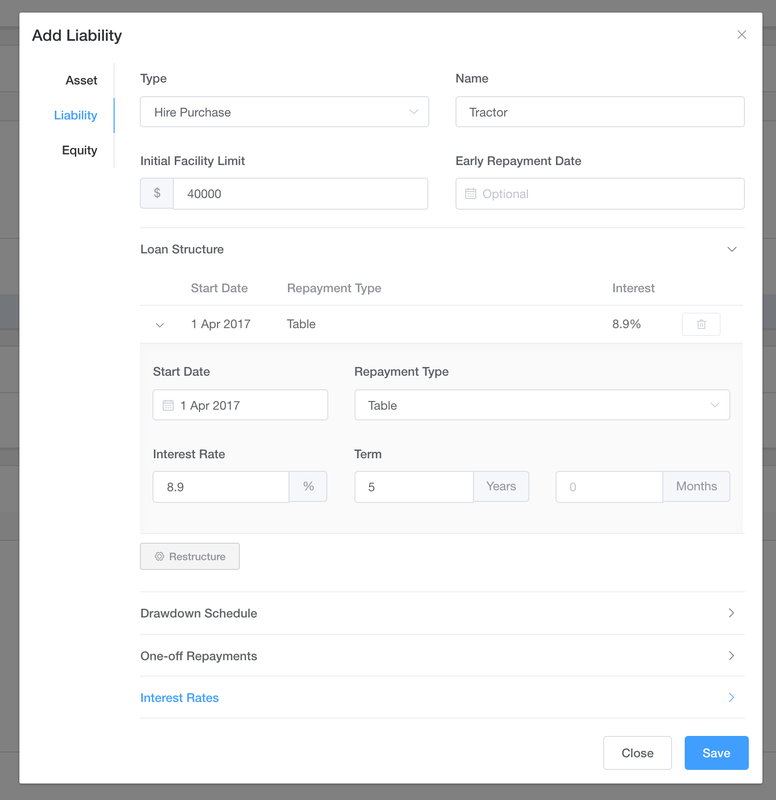 As part of adding in liabilities, you can utilise loan restructuring to reflect the changing parts of a loan. 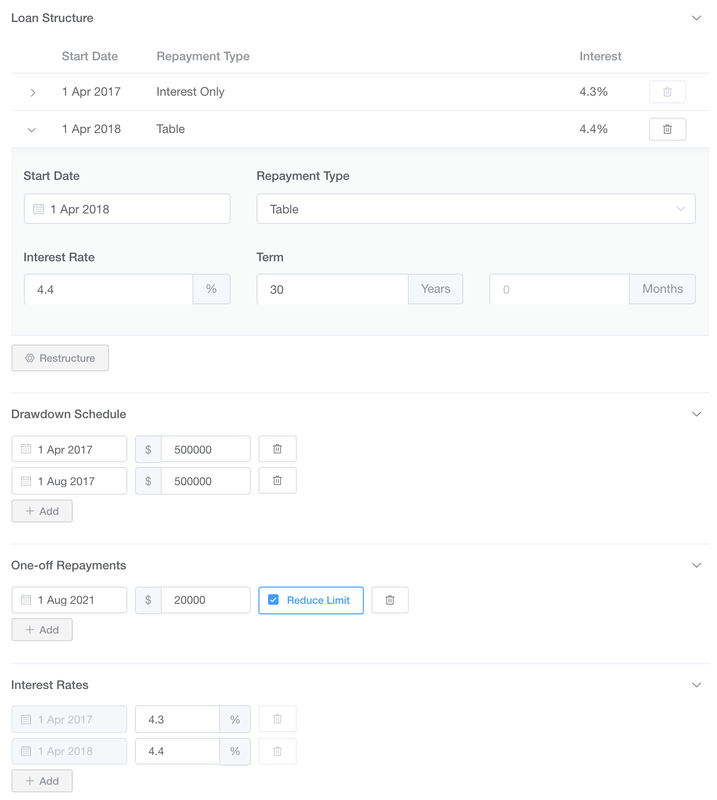 Your liabilities can also have a determined drawdown schedule, you can make additional one-off repayments, and you can customise the interest rates. Drawdown schedule is used for when you do not wish to immediately have ("drawdown") the total value of the loan on the start date paid out to your bank account. For example, if you purchase a new home and your mortgage is the cost of the home along with additional funding for renovations, you can drawdown 80% of the mortgage to purchase the home, and the final 20% can be drawn down on after 6 months for you to begin renovations. The date you drawdown is when the money will come into your Cashflow report. NOTE: You cannot drawdown a value that is greater than the total value of your loan. One-off repayments are used if you wish to make additional payments towards your loans, these funds will come from your cashflow - you can first create a new equity asset in your proposition if, for example, the one-off repayment was gifted to you. You can check to Reduce limit which will mean these additional repayments will lower the total amount of your loan, and you will have less funding available to drawdown on. Interest rates will automatically populate when you restructure the loan, however you can add additional interest rates at any point during the scenario without further restructuring. Add new equity into your scenario cashflow - or owner funds introduced. Equity can be a gift from your parents, winnings from lotto, or a wallet you found on the ground. All you'll need is a name, date, and amount you wish to have added. If, as part of your proposition, you are acquiring a new stock type, you'll need to add a new tracker into your proposition. 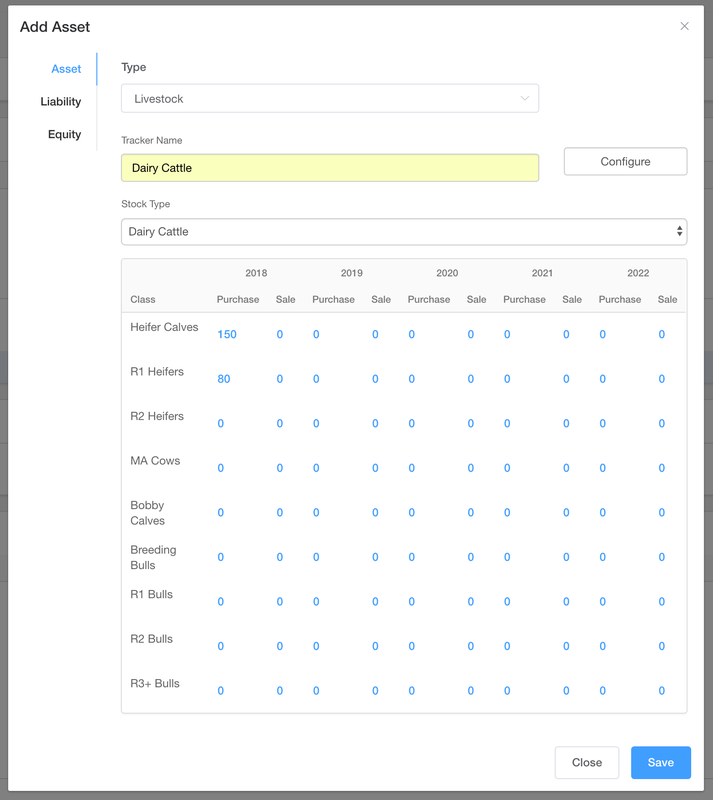 Select a stock type and configure what livestock you will be purchasing & selling. This will then flow through to your income section of your proposition. Once your proposition assets & liabilities have been added, you can move onto entering your proposition expenses & income.